Facial toners are an essential part of a daily natural facial care routine! Tone, hydrate, tighten pores, and balance the pH of your skin with our natural facial toner. Every good facial routine should include a toner. Plant based toners, especially hydrosols, make the best facial toner. Pure floral hydrosols, a.k.a. distillates, are delicate, healing plant waters that contain all the skin healing qualities of the distilled herb. 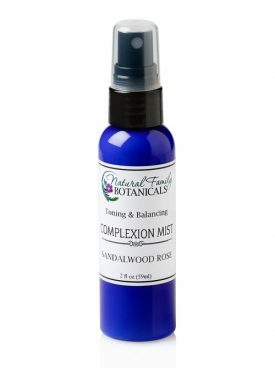 Use our Aromatherapy Complexion Mist everyday after cleansing to help tone, tighten pores, and hydrate your skin without any drying or irritating effects. Hydrosols also make a great aromatherapy spritzer to use throughout the day, for a quick rejuvenating spritz and to freshen the air in your surroundings. At night, you can spritz some on your pillow for the soothing and calming aromatherapy benefits of these healing hydrosols. Wonderfully refreshing to use!